When entering the hotel I am greeted by a footman in a dress worth thousand and one nights’ story. In a hallway, a couple is intently watching TV – they do not play latest CSI episode, but a very thrilling “arrival of cars” movie. When their car is chauffeured in the driveway, they get up and leave. Behind the entry hallway there is a large hall with a dome and a picture of one of the sheikhs. The hotel reception is to the right and on the left side there are some comfy leather sofas. Further down the hall, there is an exhibition of calligraphy paintings and glass works. Caligraphy is very popular art here. Opposite, there is a selection of luxurious items for sale on display. Golden iPad case anyone? Further down, there is a large sign “No photography” and I unwillingly obey, closely watched by a guard. Just imagine the most amazingly decorated delicious chocolate and fruit cupcakes and muffins in the display in front of you. 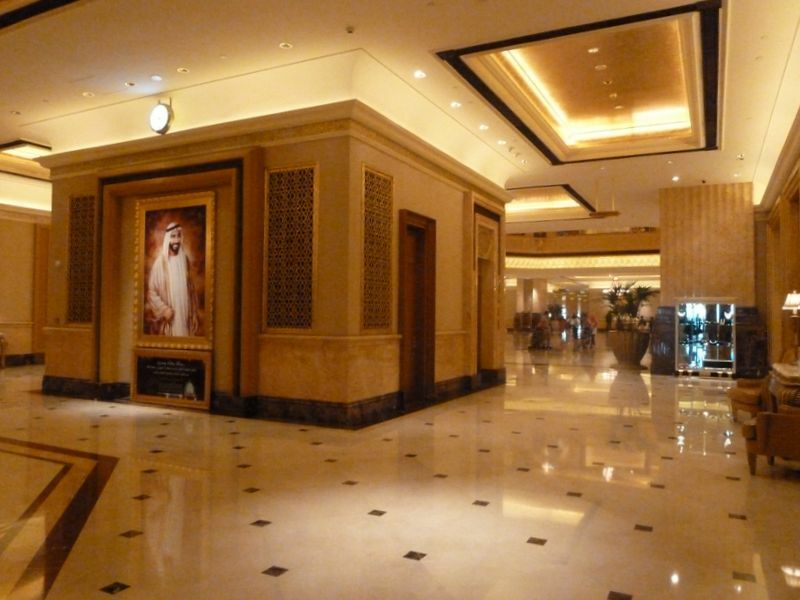 Sourced from Wikipedia and other websites, Emirates palace was opened in November 2005, but spa and some restaurants were opened one year later. It has 114 domes, some of them almost 80 metres high. The palace is made largely of marble and gold and it cost around 6 billion USD to build. The hotel reportedly has a seven-star rating, but it must be for marketing purposes as the original hotel rating scale has only 5 stars. There is almost 400 rooms and suites, a private helipad, spa, fitness, many restaurants and bars, shopping alley, auditorium and conference centre, marina, private beach, soccer, rugby, tennis and polo areas and gardens. And before we finish a few by-the-ways – there are a gold vending machine in the lobby, handmade carpets on the walls and some water fountains and mosaics to cool down the warm glow of gold. A to este asi nebude ta najvacsia opulentnost v uae, ze? Cupcakes boli na zjedenie?